Our Founder Andy and Swim Smooth Founder Paul Newsome go way back. We recently officially partnered up to pool (pun 100% intended) our expertise to help our respective communities perform at their best in and around the water. Team PH's Andy, Jonny and James have all been using the Swim Smooth Guru app to get the most of of their swim training (they're all training for swimrun races later in the year and James is also going to the IRONMAN 70.3 World Champs in Nice). They reckon this is going to be really useful and so we thought we'd ask Paul to explain CSS in more detail in case you wanted to use it in your training too. Ok, so, if you don't know already, your Critical Swim Speed (CSS) is your threshold pace when swimming. It's roughly the pace you can swim a flat-out 1,500m and is a single number which you can base all of your training intensities around. For instance, in our squads in Perth, swimmers in lane 1 have a threshold pace around 1:50-2:00 /100m, lane 2 1:40-1:50 /100m, lane 3 1:25-1:40 /100m and lane 4 1:15-1:25 /100m. You'll find a similar split between the lanes in every Swim Smooth squad around the world. If you have trained with a power meter on the bike you probably know your FTP (Functional Threshold Power) and when it comes to running you might be aware of your threshold pace, the pace you can sustain for a race around 10km to 10 miles in length. CSS, FTP and threshold running pace are the equivalent thing in all three sports. Know them and you can train different energy systems accurately and track your progress over time. After a thorough warmup and after a few key drills, swim a 400m time trial. Pace it well and remember this is a flat out effort, you shouldn't finish and think "maybe I could have gone harder"! If at all possible, have a friend, coach or lifeguard time your first 100m split of the 400m. As we'll come to later, this will give you real insight into your pacing abilities. Record your overall time and also your 100m split. Spend a few minutes recovering with some easy laps of freestyle until you feel you are ready for part 2; a 200m time-trial. Again, well paced and a good hard effort. Record your time. Note: if you're in a yard pool, swim 400yd and 200yd time-trials instead. Armed with your times, enter your numbers into this basic CSS calculator. Or, for a much more thorough analysis (including pacing analysis and performance predictions over different distances), use the Swim Smooth Guru (Pro subscription required, see below for details of an exclusive discount for Precision Hydration athletes!). So, how do you control your pace to swim at CSS? 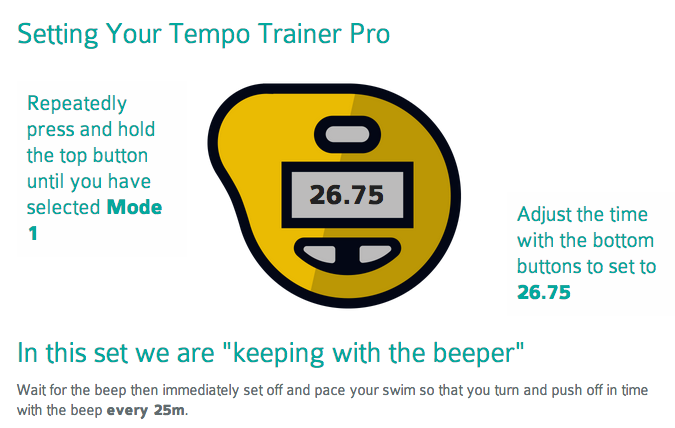 The secret is to use a Finis Tempo Trainer Pro set to beep at regular intervals such that you pace things out to be passing every 25m (or 25 yards) when it beeps. For instance, if your CSS pace is 2:00 /100m then set your beeper to 30 seconds. Get ahead of the beep every 25m and you're going to fast. Behind the beep and you're travelling too slowly. 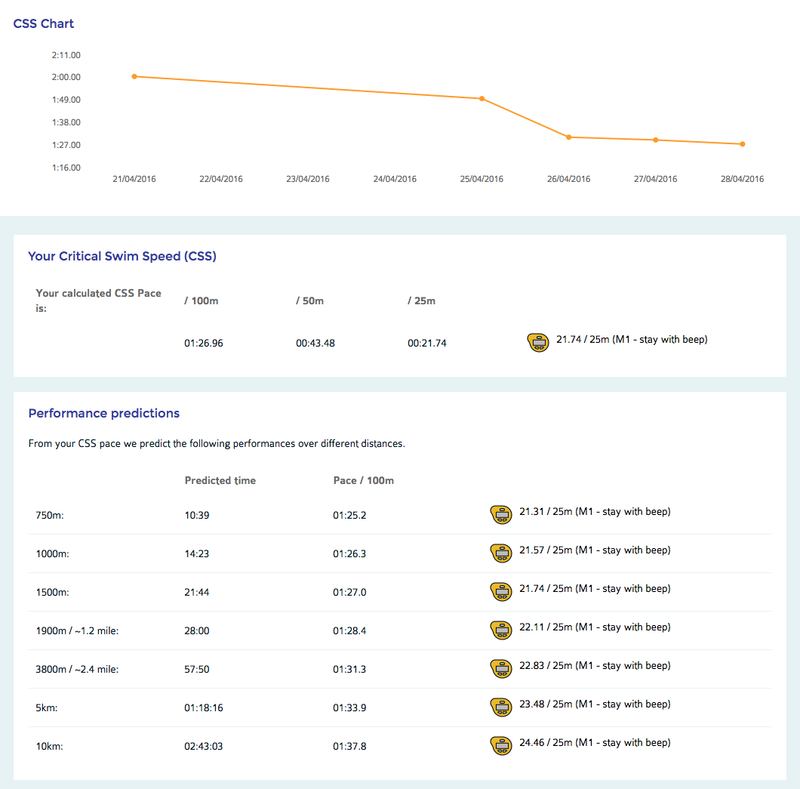 The key to CSS training is sustained speed with short recoveries. This is a little different to traditional master's swimming, where the swims are faster but with much longer recoveries (sprint training). That's 1,800m in total, suitable for swimmers with a CSS pace around 1:30 /100m. If your CSS pace is around 1:45 /100m we suggest a set around 1600m. If your CSS pace is around 2:00 /100m try 1400m in total. With a Pro Guru subscription you can take CSS training to the next level. First up, there's hundreds of fun and effective training sessions in the Guru for all ability levels. Each uses your CSS pace to set your intensity accurately. Tell the Guru how your session went and it'll automatically adjust your CSS pace up or down for the next time. This means it's not necessary to perform the CSS test regularly as the Guru will actually track your CSS pace as you go along. We call this process "CSS tweaking", something that's unique to Swim Smooth. CSS isn't a concept that Swim Smooth invented, but we like to think that we've popularised it for swimmers and developed a whole system of focused, effective training around it to help you achieve your potential in the water. If you do want to give the CSS features of Guru Pro a try, we've hooked PH customers up with an exclusive discount on the Guru coaching platform. Just use the code 69VC-K4EU to get 30% off a 3 months Guru Pro subscription or 10% off an annual subscription! 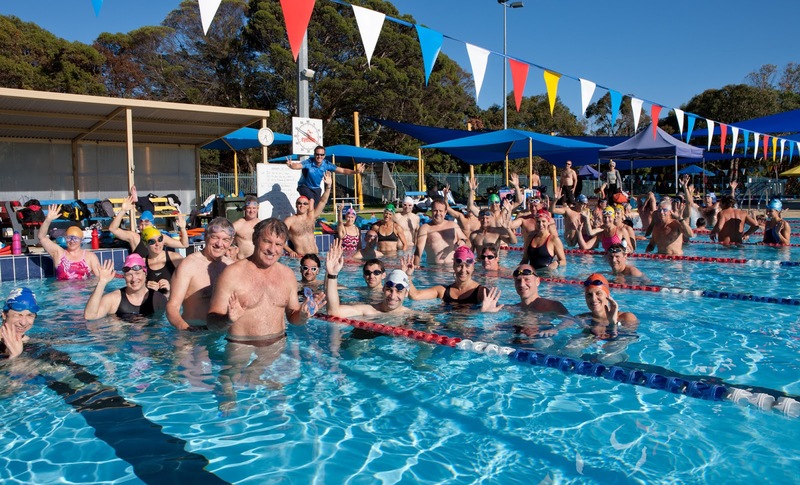 Paul Newsome is the founder of Swim Smooth, the popular online swim coaching program and provides detailed and personalised coaching at swimsmooth.guru. He previously wrote about when taking fewer strokes makes you LESS efficient for the PH blog.